Last year, I was trying to pencil in a few adventures and travel destinations. 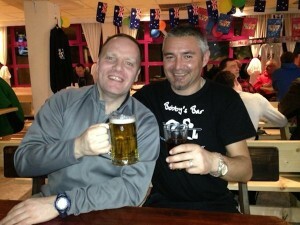 Glenn and I went for a curry and he said that he was going to Borovets in Bulgaria and I was welcome to come along. 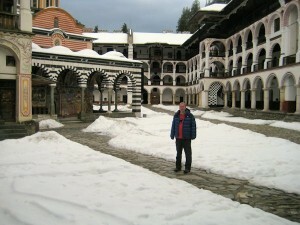 I’d never been to Bulgaria, but it sounded ok, so I weighed up the pro’s and con’s. Its predominantly a ski resort, and he was going there to “board” (I find Ski’s and stuff like that as interesting as doing the washing up, and you don’t get open fractures, doing forks). I didn’t need to board, as I reckoned, I’d find stuff to do, meet lots of Bulgarians, and go walking in the mountains (and in the pub). I was going and the deal was done before we’d finished our starters. On Friday morning I’m on my way to work. I jump straight on the train, and due to “the weather” the train takes me directly to Manchester. I have to wait another 30 minutes, then a train takes me back to work. Total travelling time, 3 hours, instead of 23 minutes. In the evening, I go out for dinner with a friend. As we leave, I realise my passport and stuff for my trip are at my friends house. All taxi’s have been cancelled due to “the weather” again. We walk home in appalling conditions. Its awful. Its now 3am in the morning, and I wake up ready to be picked up to travel to the airport. Both of the above problems, have been caused by snow, and I wonder for a moment if travelling to a ski resort is such a good idea after all ! No matter, the arrival of Glenn’s smiling face, and were on the motorway headed for Manchester airport (which I’d like to say is far better than Liverpool airport for those interested). 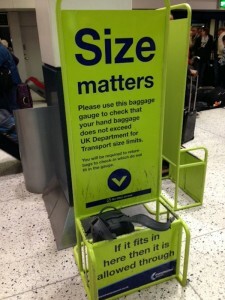 Once there, I’m delighted to see that my diligent packing, and years of buying small and light outdoor gear, have resulted in a weeks worth of gear (including laptop) fitting into a bag, which will itself, fit into the overhead luggage checker 2 and a half times !. Easyjet are trying to move up market, but many of their passengers have no such concerns. Glenn sits in the chairs with big leg room, and I end up at the back in the middle of 2 stag do’s. The stag do in front of me are from Newcastle, and the one behind from Wales. They insist on speaking in welsh, but don’t seem to realise that 50% of what there saying begins with f, b and c, so translation isn’t hard. The check in was really early, and as I’ve said before, its 1 thing to try to get to sleep on a plane, its another to actually need sleep on a plane, and I’m tragically in the 2nd category. My seat has the leg room of a milking stool, and I’m in the middle seat, so nowhere to “lean”. Awful. But, 3.5 hours later, we land and every things fine. We’ve arranged private transportation, so no mucking about with buses. Gerry introduces himself, and we set off. We drive past abandoned east European factories. This is the Eastern Europe I’m used to seeing. After 40 minutes, we stop by a bar next to Iskar lake and have drinks overlooking it. Its the biggest lake I’ve every seen, and I’m surprised when I’m told that it sometimes freezes across its entire surface area. 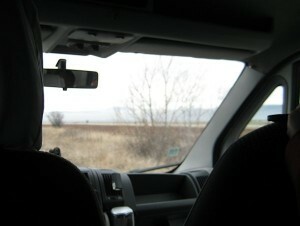 We continue on our journey, the other drivers are maniacs, and I’m relieved when we finally arrive at our destination. It Should be mentioned at this point, that I’m wondering how this trip will work culturally. All the snow boarders and ski-ers that I know are near fanatical. I’m interested in neither and effectively, I’m along for the ride (pardon the pun). For the first time, ill be on a trip, and ill be on the outside looking in. Reminds me a bit of the music journalists who went on the road with the rolling stones in the early day. Above, one one of the friends I would later meet. He had a real name, Dan but I called him East 17 due to his cockney accent and cocky manner (yet 1 of the friendliest and most charming people, I think I’ve ever met). Our first port of call, Bobby’s bar. 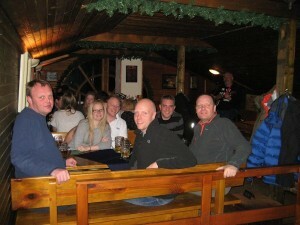 Its considered one of the best bars in the whole of Borovets. 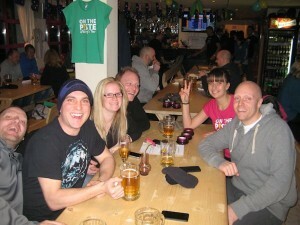 At the front, on the left of the picture, is Glenn and on the right, at the back is one of the bar staff Izi. I pointed out that Izi was a daft name, and Alison was far nicer. We agreed that if I tipped her reasonably, and I could just call her Alison, and she’d keep bringing me drinks (it didn’t seem to bother anyone). Our cockney friends were enormous fun, and genuinely good company. I came to think of them as our adoptive cockney family, which I abbreviated to ACF. Fantastically, I’m booked into a hotel, located directly above the bar (everyone else is staying in chalets and hotel around the town). 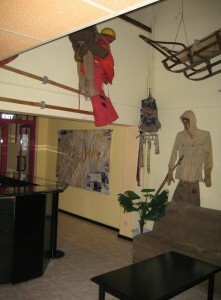 Its actually attached to the mountain rescue centre, and the reception has all sorts of vintage equipment and clothing from a bygone mountain rescue era. Back to the bar, and it turns out, its Australia day (I love Australia and its countrymen, but for the record, I want to complain officially, about the way they get a day of for the queens birthday, when were British, its our Queen and we don’t !). 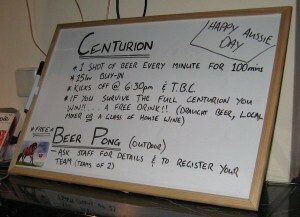 Glenn, the ACF and I take part in a game called Centurion. The idea, is that a shot glass is filled with beer, for each participant. You have 60 seconds to drink it, and if you miss the deadline, you have to drink that and 1 other for every minute that your late. The target is 100 shots, in 100 minutes (basically, 7 pints). I’d already had 4 pints, but after a stressful flight, and with such good company, it sounded superb idea. We got through it pretty easy (a few mouth under 25’s on a different table, had a go, but couldn’t keep the pace). The only technical problem, was the toilet. You had to be there and back in 60 seconds or you’d incur a penalty. Alison (real name Izi) kept filling up my glass, and we stormed it. The prize for completing, was a drink of your choice. 11 pints is more than I usually drink now, and this is local beer, which is a lot stronger and richer than the Carling I’m used to drinking at home. I donate my drink to my able assistant Alison, to enjoy when she finished her shift. In the morning, Glenn takes the “day off” from boarding, and gives me a tour of the town. 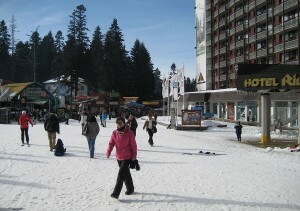 The resort is literally 20 metres from the foot of the slopes, which I’m told is unusual. I’m delighted by the good humour of the people I meet. We visit a few different hotel lounges and bars. 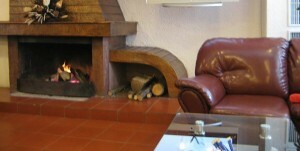 I’m going enjoy it here, nearly every place has comfortable leather chairs and an open fire. In the afternoon, I head back to Bobby’s bar for something to eat (I have a Chicken pizza delivered by Alison, along with 5 pints (but not all at the same time)). I’m used to spending time in the mountains, as hill walking and mountaineering are my hobby. One difference I’m noticing, are the equipment and the clothes. Well, the equipment is pretty obvious. If we go off hill walking, we dont carry a snow board with us just for show, but in terms of clothes, snow boarders wear coats like the one above, and I’ve never seen such attire on the Clywidian hills !. Glenn is in his element. He’s been coming here for 12 years, and is something of a celebrity. Here he shares a drink with his old friend Bobby. 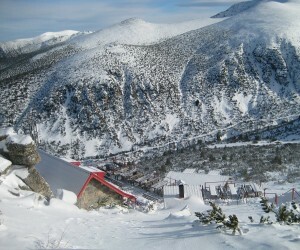 Bobby is a local legend (his actual name is Borislav) and as well as a bar owner and expert Ski and Snowboard instructor, he also trained Eddy the eagle to Ski jump. Technology is never far away, and just about everyone, has some sort of mobile phone app, to measure the distance/speed etc of their boarding and ski-ing. 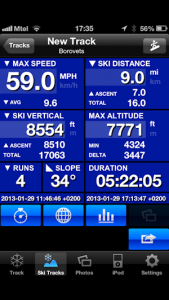 Glenn has asked me to post this, as it shows his speed of 59 miles an hour. Being a good friend, I immediately called the medical centre and arranged for him to be taken away and locked up, for his own safety. I’m always on the look out for adventure, wherever I am, and as we were out and about, meeting people and touring the bars, I saw this snow tunnel had been dug. I thought it would make a good snow hole picture (I’ve actually slept in a snow hole for 4 consecutive nights on 1 occasion). 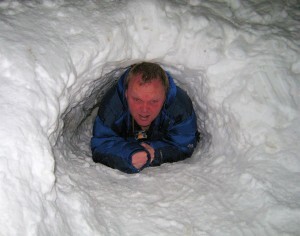 I started crawling in through the back of the tunnel, and Glenn arranged to photograph me from the front. The food and drink had flowed freely throughout our trip, and for 1 terrifying moment, I thought I was going to get stuck in the hole, and Glenn was going to have to dig me out. As it was, I was ok, had the photo taken, and I was back eating a Calzone pizza big enough for 3 people, before you could say “fat stupid idiot”. 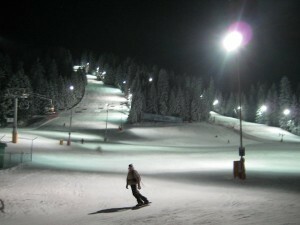 In the evening, the slopes were lit, and people continued to Ski. 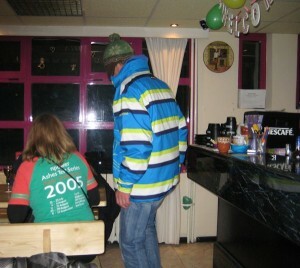 I thought briefly about having a snowboard lesson, but decided against. Its 1 of those spontaneous decisions you make, when everyone around you is doing something and having a good time. Its easy to forget that you’ve tried it 3 times before, and find it un-inspiring. For practical purposes, it would be simpler and quicker to just hand £25 to a complete stranger. I’m content with what I’m doing I decide. I’m relaxing (which I don’t normally find easy), I’ve got some great company with Glenn and the ACF. 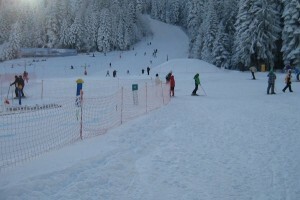 Glenn explains that he’s back in Borovets in a few weeks. He’ll be staying at an exclusive hotel this time, so we decide to go there for a drink. The Festa is lovely inside, but has the atmosphere of the moon. I reassure Glenn, that’s only because its empty. Come back with a few people I say, and this place will come alive. Its certainly a step up from the basic accommodation I’m staying in, but I wouldn’t trade my room for anything, its my cocoon, and I’m comfortable there for the week. Its time for some more adventure. 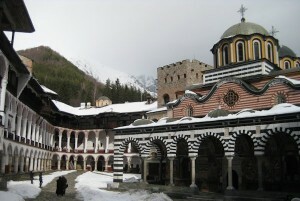 Glenn takes another day off, and we head for the Rela Monastery. On the way there, we pass through loads of empty wastland, that must have been used for farming before the fall of the Berlin wall. It reminded me of the scenes in COD Modern Warefare 4 taken in Chernobyl. This time it was our turn to have a psycho driver. On the way, our guide Cyril gave us a potted history of Bulgaria going back 2000 years (Glenn fell asleep towards the end of the Byzantine occupation). Bulgaria is land locked, has loads of different boarders and has therefore been invaded lots of times. We finally arrive at the monastery, as our chauffeur nearly runs over a dog. It’s taken 90 minutes to drive here (in the summer months, you can just walk across the hills from Borovets) but its been worth it. 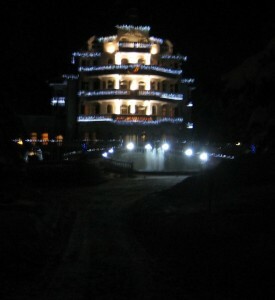 Its spectacular to look at, and as theres snow on the ground, has the feel of a Tibetan monastery. The place somehow escaped destruction during the 550 years of the Ottoman occupation (which the locals call the years of the Muslim Yoke (very pc)). The pictures and Fresco’s are more than 200 years old, but could easily have been painted the previous day. The Chapel was incredibly ornate, but unfortunately, we weren’t allowed to photograph in there. 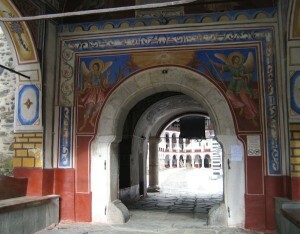 300 + Monks live in the Monastery. 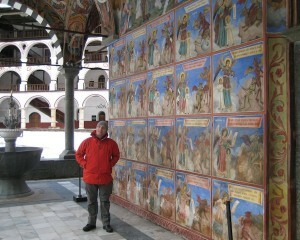 We were allowed to walk around the forecourt, and not go to the upper levels of the monastery. Understandable I suppose, its someone’s home after all, but I would have loved to get up high and see the are from the beautiful wooden balcony’s. Glenn took us to a place that served amazing steaks. He said they were so good, they’d be among the best steaks we’d ever eaten anywhere in the world. As it was he was right. They cost about £15 in Bulgarian money (which in this part of teh world, would buy 2 human kidneys) but they were worth every penny. As frequently happens, I go out for an excellent meal, determined to take a photograph of everyone, just as the meals put out. As usual I completely forgot, and ended up with this photo afterwards. Me, Glenn and our ACF. It also reminded me how different the world can be, seen through different eyes. Like many of the places we visited, it had a wooden interior, which I though looked pretty smart. As an expert joiner Tony pointed out that the wood was sub standard, and the work had been done in a hurry (which when I looked more closely, it had). The barmaid seemed able to carry an enormous number of glasses at any 1 time and possible applications of her hand and finger dexterity were discussed at length. For such a cheap and yet high quality resort, some of the bars seemed to struggle a bit, and in the evening, it was common to see a pub with just 1 person in it. I couldn’t help thinking that latter day communist/none enterprise thinking was the culprit. Standard format seemed to be attractive girls like Alison working inside a bar, while 50 year old men in overcoats stood outside beckoning you to come inside. Seemed to me, they had this the wrong way around !. 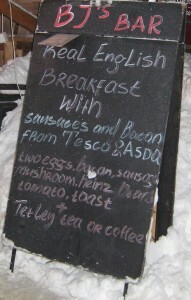 Still, competition is the friend of the consumer, and as you can see from this sign, the English breakfast, wasn’t just cooked in an English style, it actually had English ingredients flown in from “home”. After this whirlwind holiday of new friends, wild evenings and relaxing days, I lament that its my last day, and it will be time to go home soon. But the time when you feel most like moping on your own, is exactly the time, to jump in and find adventure. 2000 feet + above where I was standing, was an amazing hill top, the Masala pathway (it was easy to remember its name, I just thought of Tikka Masala). Better still, instead of several hours walk, A cable car would be able to take me to the top. Alan lent me his Ski pass, so it didn’t even cost me any money. I had intended to travel up the day before, stay at the Yastrebets stone hut, then walk down the next day. 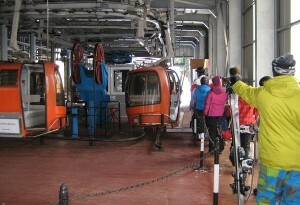 Unfortunately, the weather was really bad and the cable gondola closed the whole day. The following day, it was open in the afternoon, but by the time I got there, its was 3pm, so there was no time to walk down. On the plus side, the weather was the best I’d seen throughout the trip, and you could see for miles across the mountain tops. In the photo above, you can see the roof of the hut I would have slept in. The view back across the mountains was spectacular. 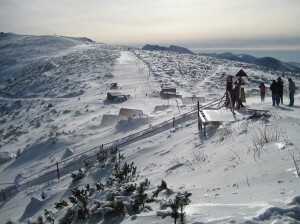 When I think of Bulgaria, in my mind, I’ll see the photo above. I’d like to thank Glenn who single handedly organised the entire trip, so as a welcome change, I didn’t have to do a thing. I’d also like to thank Michelle, Tony, Dan and Allen. They hardly knew me, but made me feel welcome. Just a small thing, but makes a difference when your a long way from home. 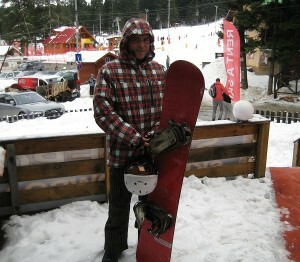 Snow boarding isnt for me, but if you reading this, and fancy trying it, go to Borovets. Its probably cheaper to spend a week there than it is to stay at home and if you grow to love boarding or hate it, you’ll never regret going there.